Loneliness and isolation have long been known to cause mental health issues for the elderly. In more recent years, it has also been shown to cause a myriad of physical health issues, as well. Combatting loneliness, however, does not just happen naturally. It takes a concerted effort to fight against those feelings on a daily basis, but it also takes a great effort to change your social life in order to accommodate social interactions that previously would not have been a priority. When we are younger, employed or raising a family, social interactions occur somewhat naturally based upon those social structures. As we grow older, they may not occur in such a natural way unless we arrange for them to happen. So here are a few ideas for you or for an elderly loved one to get out and about and interact in a way that can introduce them to new, meaningful and restorative relationships with others. Senior center meals and activities. Most small communities have a senior center where older members of the community meet together to eat and do other activities. If you locate one in your area, find out what their schedule of events is, them mark some of the dates on your calendar to try out. You needn’t feel obligated to go to each one, but rather choose a few during the month that are of the most interest to you. Craft or hobby groups. If you are interested in creating crafts, or if you have a specific hobby that is meaningful to you, try to find a group of people interested in the same hobby with whom you can participate. Many communities have quilt guilds, woodworking or whittling groups or crocheting clubs. It is best if you can find a group where there are people from several generations and multiple backgrounds involved. You may be surprised. Perhaps the ones that you hit it off with will be from a much younger generation than yourself. This opens an entirely new world for both you and for the younger person. We all need one another, and this could be a very beneficial relationship for each of you. If you cannot find such a group, consider starting one. Hang flyers & let a number of people know where and when you’d like to meet and how often. Maybe there won’t be an interest, but perhaps there would be, even from one or two individuals. Many communities, churches or even hospitals have group exercise classes for the elderly which you could join. They focus on physical activity appropriate for the aging individual that will not jar or strain muscles and joints unnecessarily. Meeting people in this way will keep you active & you’ll meet others who do not want to be closed up at home all the time. Whether you’d like to volunteer at a thrift store, a veteran’s home, helping with a parade, at an animal shelter, helping to judge at the county fair, in your place of worship, etc. your service can be a huge help to the people you volunteer with. Over time you’ll get to know those with whom you are working and have the added benefit of being of valuable service to others. Places of worship. Often-times places of worship are great places to get to know others. Apart from the regular services, they often offer other classes throughout the week for people to be involved in. Often, they will offer outings like retreats, help at a local food bank, or even caroling outings to other locations to be involved in. The best way to meet people is to get creative. If you’re interested in learning an instrument, learning to pain, learning a language, then go ahead and sign up for a class. Meeting people with similar interests in not difficult. Be Creative. If none of these seem like viable options for you, be creative. Organize an event that you can invite people to. Perhaps host a dinner for others or arrange a garage sale to benefit a certain organization, or a benefit for a person you know who is ill. Organize an informational meeting on a particular item of interest at your local library and put up posters about it. You never know how or where you might meet others with whom you share an interest or a similar background. You do not have to have everything in common with someone that you meet in order to share parts of your life. Over time you’ll both learn to appreciate the differences you find in one another. 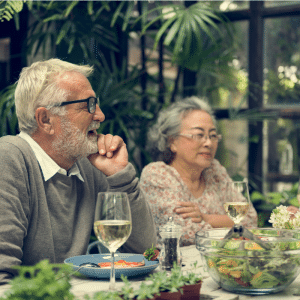 Social gatherings can be awkward and somewhat exhausting, especially if your personality tends toward being introverted, but there are huge benefits to your health if you reach out and take the first step toward more relationships.